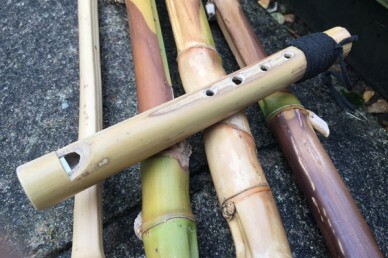 Okay we have a rhythm section supplied by the previous bottle cap tambourine project but we need something to add the more intricate melodies and what could be more perfect, certainly if you are a folk fan, than a bamboo flute/whistle/recorder? 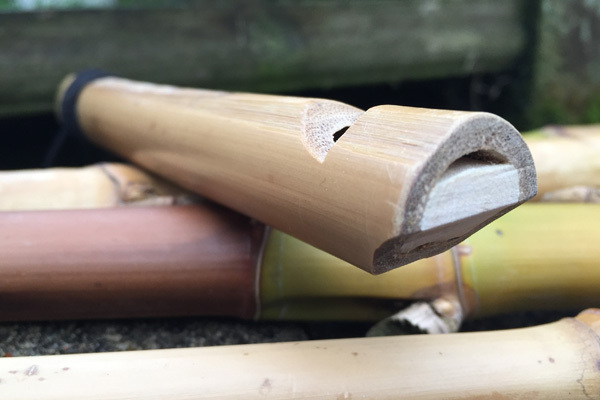 Very simple to make with few tools, these handmade woodwinds can produce a great range of notes either by the use of holes in the body of the instrument or by use of a slide to produce a swanee whistle. 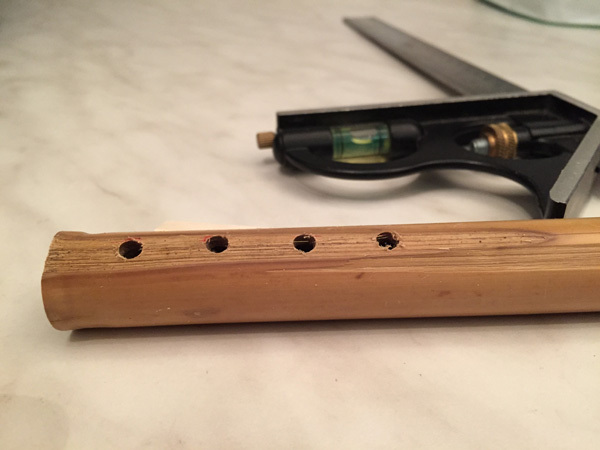 The most complicated part of the project is adjusting holes to produce a pleasing scale and, more fundamentally, finding a suitable piece of bamboo. 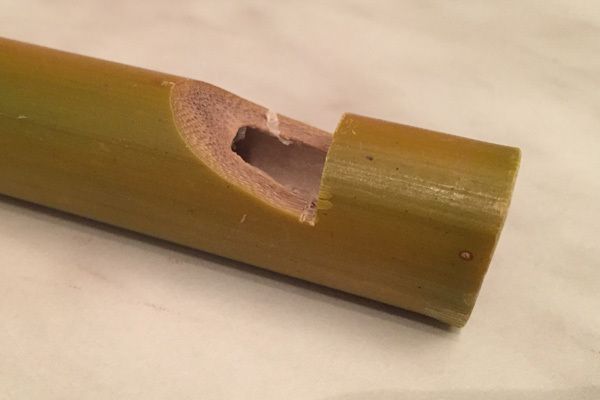 You can make a whistle from practically any hollow pipe, including plastic tubing used for plumbing, but we have chosen natural bamboo for this project. You will need to source a cane that is slightly wider than the standard garden issue ones. 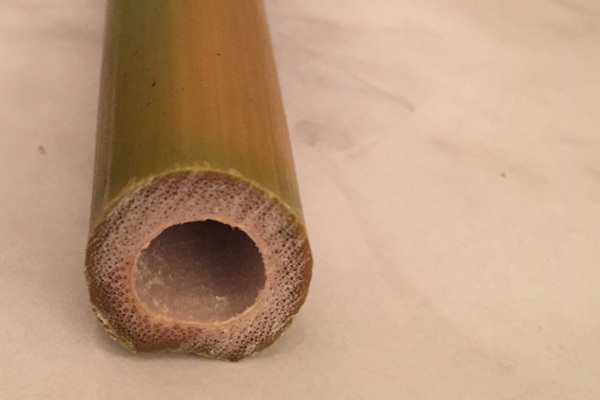 It can in theory be as long as you like but it needs to be open at both ends so length may be dictated by the chamber size along your bamboo. About 12 inches long, 25-35mm diameter and as round as possible would be ideal. I managed to source some of the right diameter from a kind donation following a request on Freecycle. The chamber length was a little short but, determined not to be beaten by this issue, I glued and extension on to my best section with epoxy – later to be covered by a leather carry strap – which seemed to work well. First thing you need to do is cut the notch which produces the edge that ’splits’ the air and produces the sound – this is known as the blade and the science explaining how it works can be found here. About 2cm from the top start cutting vertically downwards until the blade is just visible inside the tube. You then need to cut at an angle towards the newly made vertical cut forming a notch and creating the splitting edge. 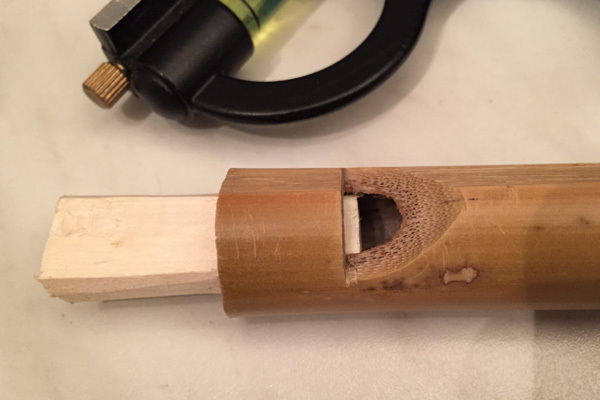 To channel air over the splitting edge you now need to take a piece of dowel or stick of the right diameter to fit snuggly in the pipe and long enough to allow adjustment back and forth. 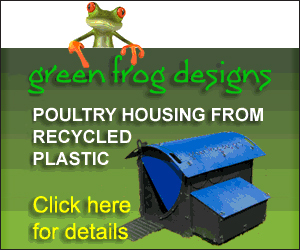 Take a small sliver off the top to create a flat surface this can be done with a knife or by rubbing on sandpaper. Some makers suggest a slight upward curve to the end that faces the splitting edge is advantageous but I don’t think this is strictly necessary. When inserted this creates the air channel to direct air over the blade. You may need to adjust how far the plug goes in to the tube and the amount that you shave off the flat surface to get the best sound but it is worth spending the time doing this as it is fundamental to the sound of the instrument. When you have achieved a good sound you can glue the plug in place, trim it flush and form the mouth piece with a knife or suitable saw. It is difficult to tune to an exact scale (I’m sure there are tutorials by those more technical than myself on the internet) but placing your fingers into a comfortable position on the instrument and marking the gaps is a good starting point. Shorter instruments, like mine, can use four holes, longer ones six. You can then drill small holes, cover them all with your fingers and starting at the bottom lift your fingers off as you blow to see how the scale sounds. Make the holes gradually bigger to adjust notes to a higher pitch – this is why you start with small holes as you can’t fill them in again. After you have achieved a good natural sounding scale of notes the instrument is finished and you can think about decorating it. You might prefer to leave it with a natural finish or let your imagination run wild and personalise as you like with paint, glued on materials, by carving into the wood or even with pyrography (wood burning). You could also add a leather handle or neck strap as I have here using some leather laces left over from my tambourine project. My paw paw used to make these and other whistle’s out of sticks and other scrap wood when I was a kid.glad to see someone is carrying on the tradition.